composer, improviser, pianist and sound artist. edith alonso was born in madrid and began her classical studies playing piano but got interested quickly in other instruments (guitar, saxophone) and styles (jazz, rock). in the early 90’s she played the electric bass in a well-known punk-rock band of the underground scene. she moved to paris where she studied electroacoustic and instrumental composition and discovered musique concrete with composers such as françois bayle and pierre henry. phd in arts, sciences and technologies at university saint-denis-vincennes (paris) and university complutense (madrid). very active in the improvisation field she explores sounds in many processes always in an innovative way and changing of set frequently. she usually collaborates with other media, including film and dance, as well as sound installations. 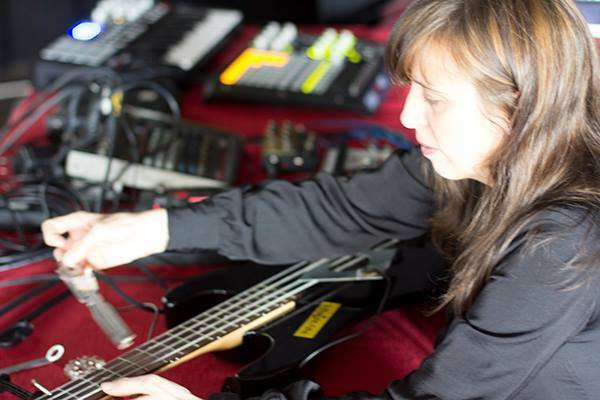 her compositions have been performed at numerous international festivals, including the international computer music conferences of belfast and montreal, simc (international society for contemporary music, paris), smc (sound and music computing conference, lefkada, porto), xxiv contemporary music festival of alicante (spain), synthèse (bourges, france), and others in portugal, spain, austria, germany, sweden, south korea, cuba, costa rica, columbia, argentina, and mexico.